When people say happiness is choice, they don't mean that quality of life is largely dependent on one's attitude toward life's inevitable struggles. What they mean is, every day you decide not to move to Hawaii. You want to be happy -- so why haven't you moved to the place with all the beaches and the flower necklaces? That's a choice you make every day. But honestly, it's not just Hawaii. There are actually a lot of states in the US that are objectively happier places than the stress test you call home, and moving to one of those places just might make you feel a little better. And luckily, you're about to find out exactly which places those are via a new study from WalletHub. The ranking of all 50 states based on happiness includes a handy map so you can get a quick overview of the country, but definitely check out the full report for more info. To use the map, just hover to see the ranking. The darker the state, the happier its residents. To put this study together, WalletHub compared each state across three major categories: 1) Emotional & Physical Well-Being, 2) Work Environment, and 3) Community & Environment. Those categories were broken down into 31 smaller, weighted metrics. Each metric was given a score out of 100, and those scores were combined and used to rank the states. Those smaller metrics include things like share of adult depression, adequate-sleep rate, number of work hours, job satisfaction score, ideal weather, and average leisure time spent per day -- all of which make a big difference in day-to-day happiness. It probably comes as no surprise that Hawaii took the top spot with the third lowest rate of adult depression and the fifth lowest divorce rate in the country. 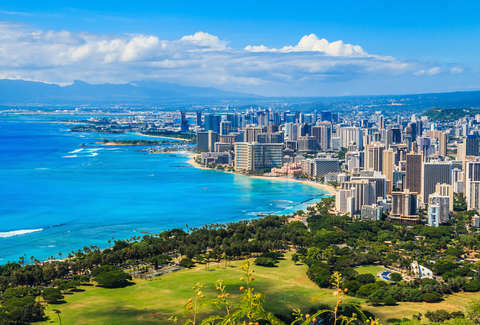 On top of that, you to live in Hawaii, the place with the beaches, great weather, and arguably the most fun name to say in these United States. Seeing both Dakotas on the top 10 happiest list was probably more of a surprise. But North Dakota and South Dakota have the two highest income growths in the US and are both made the top five for adequate-sleep rate. On top of that, North Dakota has the lowest long-term unemployment rate and the second lowest divorce rate. So, things are pretty swell in those states, whether you remember they exist or not. The same can't be said for West Virginia, which had the second highest adult depression and second lowest adequate sleep rate. Its overall score for Community and Environment wasn't terrible, but its rating for Emotional & Physical Well-Being and Work Environment were both at the very bottom. But there's some comfort in knowing that it's one of the most beautiful states in America. If you're looking for another route to addressing personal happiness, you might also consider making a whole bunch of money. If that seems like a good strategy, check out this list of the cities with the most jobs paying over 100K right now.